The relative or absolute loss of pancreatic beta cells is respectively a major determinant in the pathogenesis of type 1 (T1D) and type 2 (T2D) diabetes. Our research work concentrates on identifying intra and extracellular factors that regulate the growth, differentiation, and functionality of beta cells, and understanding the mechanisms involved in the plasticity of these cells in physiological or pathological situations. We are also interested in the vulnerability of beta cells when exposed to a pathological micro-environment (glucolipotoxicity, inflammation, oxidative stress) and in the impact of this exposure on the progression to a diabetic condition. 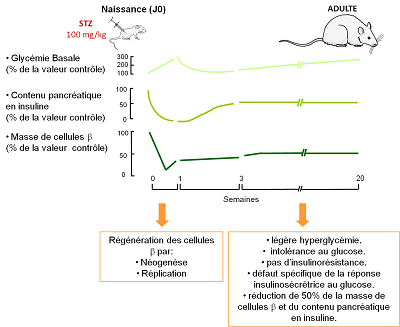 We have animal models of induced or spontaneous diabetes. The GK rat (named after the initials of the researchers Goto and Kakizaki who established this line) is a model of spontaneous type 2 diabetes without associated obesity. (A) This line of rat has been obtained by selective crossing of normal rats and Wistar strain rats, selected on the basis of slight intolerance to glucose. 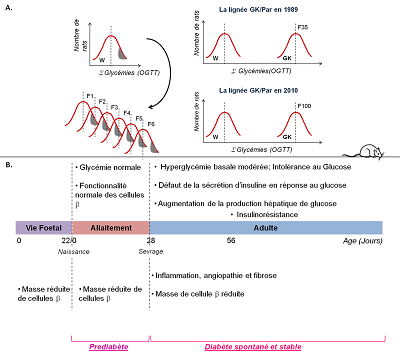 The latter has been quantified by totaling (S glycaemias) the glycaemia values from oral glucose tolerance tests (OGTT). Repeating this procedure on multiple generations (more than 30) has made it possible to obtain a stable diabetic condition. The animals of our GK/Par line (Parisian line) are the descendants of GK rats belonging to the F35 of the original Japanese line. (B) Chronology of abnormalities appearing in the GK rat. Males and females are affected equally and their diabetic condition is stable in a 72-week follow up. 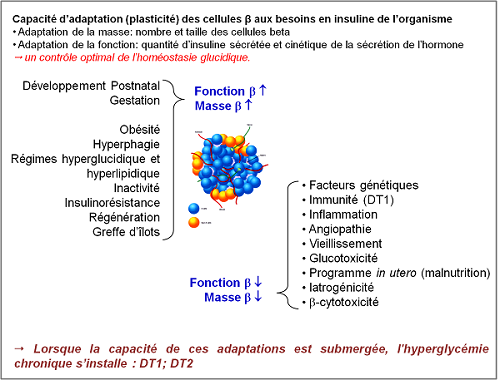 These two models present great similarities to human diabetes and constitute tools of choice for the study of the mechanisms involved in the defects in the beta mass functioning in the context of chronic inflammation and/or hyperglycaemia. © 2019 Team 1: Biology and Pathology of the Endocrine Pancreas (B2PE).